Doctor Who Series 9 Returns Tonight! Hey there, fellow Whovians, I know I’ve been a bit radio silent lately, and I apologize. Sometimes life gets in the way, but it would be remiss of me not to pop in to celebrate the return of our favorite Time Lord, The Doctor, to our screens today. And as always, I look forward to more of his inter-galactic hi-jinx. Once again, the TARDIS crew in the form of 12th Doctor (Peter Capaldi) and companion Clara (Jenna Coleman), will be back to fight the good fight, and boy, did I miss them! Series 9 of Doctor Who will see the return of Missy (aka The Master), played by Michelle Gomez, Rigsy, played by Joivan Wade (one of my favorite guest stars from Series 8), some classic era monsters like the Zygons and Daleks and another mysterious character in the form of Maisie Williams, best known for her role as Arya Stark on the HBO original series Game of Thrones. At some point we will also see the departure of Jenna Coleman, finally confirmed earlier this week. Jenna will be leaving to star in the upcoming 8-part ITV series Victoria. Her exit had been rumored for some time, and it seems, has been in the works for some time as well. NOT JUST THE TIN DOG! I wonder how the Impossible Girl will go out? And who will replace her? 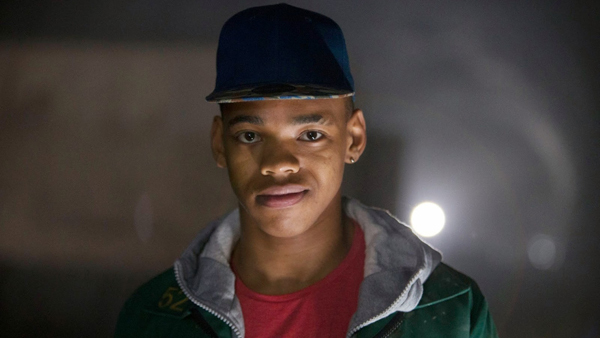 Personally, I’m hoping Rigsy (last seen in the episode Flatline) will become a permanent addition to the cast and I look forward to seeing Joivan Wade reprise his role as the young graffiti artist. He was likable, bright, compassionate and seemed to have a great rapport with Clara. We need another male companion. Traditionally, male companions haven’t done too well on board the TARDIS (Captain Jack, played by John Barrowman, was an exception, but even he had to die and be spun off onto Torchwood – no room for him and The Doctor in the same TARDIS). I think we’re overdue. The earlier Doctors had Ian, Steven, Ben, Jamie, and the UNIT team (The Brigadier, Sgt. Benton, Captain Mike Yates, even Dr. Harry Sullivan). Unlike the novels and audios, male companions on the TV series have suffered from abuse or disuse since the 1980s. We need a fresh young face, someone the Doctor can take under his wing, but can also teach him a few things, and I think Rigsy fits the bill nicely. 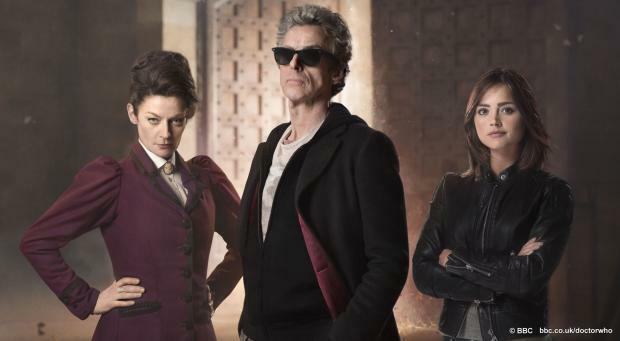 Fore more, check out the Series 9 Trailer of Doctor Who below. Doctor Who Series 9 returns tonight. American fans can watch the Doctor Who Season 9 premiere on BBC America at 9 pm ET, while British fans can see it at 7:40 pm on BBC One. From immortal monster, to Jedi, to powerful wizard. He had worn many faces throughout his long and distinguished career. 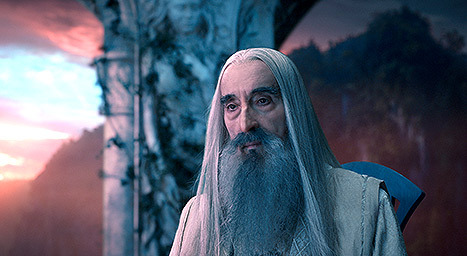 This week, the world mourned the loss of veteran stage and screen actor, Sir Christopher Lee. 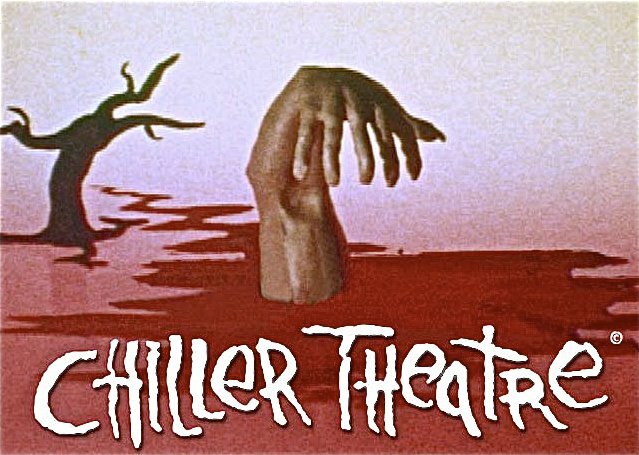 “Chiller Theatre” opening sequence. This creeped me out so much as a kid. My introduction to Christopher Lee came one night, well after my bedtime, staying up to watch Chiller Theatre. 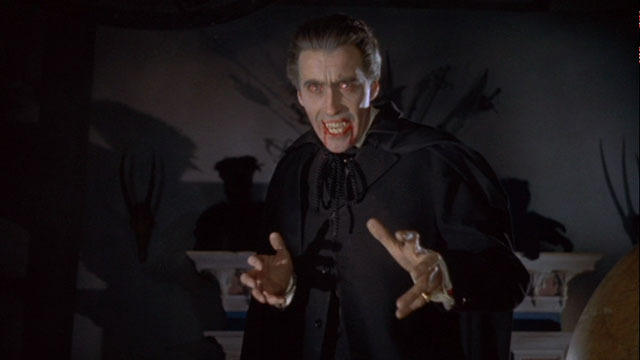 I enjoyed (usually with one eye open) many Hammer Horror films, most of them starring Lee, starting with Horror of Dracula (1958), with Lee in the title role and co-star Peter Cushing (another favorite of mine and fellow Star Wars alum) as his nemesis Van Helsing. As a little girl, hiding under the covers, peeking out just as he was about to strike at some unsuspecting victim, I was both terrified and mesmerized by Lee’s gaze. I probably shouldn’t have been, but I was hooked. Lee as Count Dracula in many Hammer Horror films. I credit my love of gothic horror to those early films. Lee’s Dracula was silent and menacing. He was far from repentant, and no, damn it, he never sparkled – he compelled – as any good (or in this case, bad) vampire should. He’d given me many nightmares, and later in life, he was also a source of inspiration for many of the stories I’d go on to write. Lee as Saruman the White in the Lord of the Rings and The Hobbit movies. Years later, I was thrilled to see him as Count Dooku in the Star Wars prequels and again in the Lord of the Rings and Hobbit movies as Saruman the White. Nearly 80 when he took on those roles, Lee showed no signs of slowing down. He even recorded the Heavy Metal Christmas album in 2012. Still cool, still relevant and still doing things his way at 90, I couldn’t help but admire him. 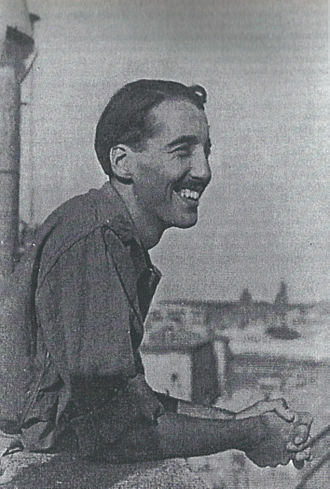 Christopher Lee in Vatican City (1944). Lee cast a long and imposing shadow, standing a full 6 feet 5 inches tall. He was a giant in every way to someone like me. From everything I’d seen, Christopher Lee was a proud man, a powerful man and a serious man. He had served in the military, was in the RAF during World War II, and had received various honors, including knighthood in 2009. The man certainly seemed the stuff of legend. Christopher Lee kept acting into his 90s, always sharp and full of purpose, and he left quite a legacy. I thought somehow he’d live forever… He was an original. We’ll likely never see another like him, and he will be sorely missed. Christopher Lee passed away on June 7, 2015, at the age of 93. He has gone to join his friends and former co-stars, Peter Cushing, Vincent Price and John Carradine (all gone, but not forgotten.. nothing is ever forgotten…) – best known for their horror/sci-fi roles. I’m sure they welcome him with open arms. Oh, the stories they must have to share. 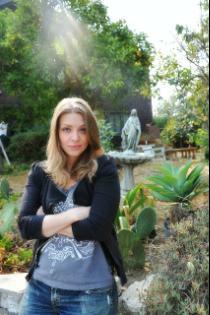 Attention Buffy Fans: Actress-Turned-Author Amber Benson in NYC Tomorrow! Amber Benson, best known for her ground-breaking role as Willow Rosenberg’s lady love Tara Maclay on Buffy the Vampire Slayer has been quite busy since her departure from Sunnydale. The beloved actress and director, is also an author of fantasy novels, including the five-book Calliope Reaper-Jones urban fantasy series for Penguin and Among The Ghosts for Simon and Schuster. 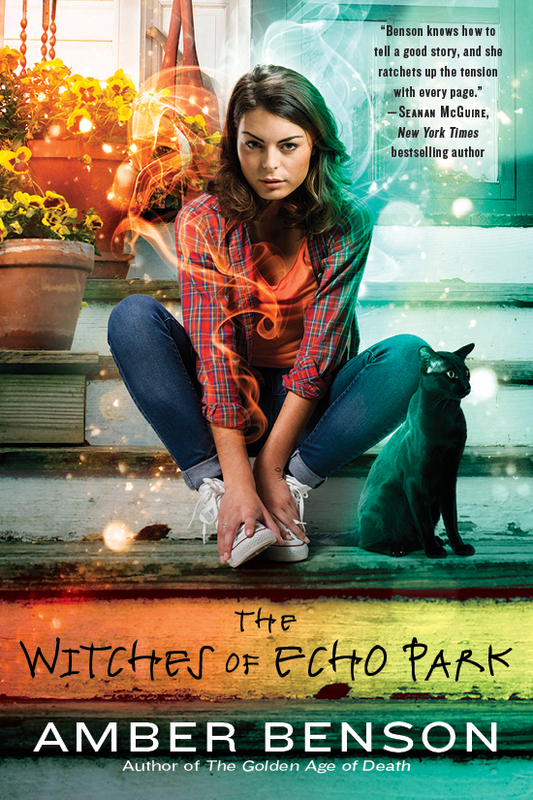 Her latest book, The Witches of Echo Park (released earlier this week), tells the tale of a powerful group of witches using their magic to keep the world in balance. But they are being hunted… and eliminated… one by one. Though I haven’t had the pleasure of reviewing Benson’s literary work, I am intrigued by this latest effort, and plan to add it to my reading list. Amber Benson will be at a book signing tomorrow, Sunday, January 11, 2015, at 2pm at Midtown Comics in NYC. Stop by, pick up a copy of The Witches of Echo Park and say hi. If you ask most Buffy fans which regulars from the series they’d like to see return, or resurrected, what do you think they’d say? Think about it… think hard. It’s not an easy choice, is it? Nor is it an impossible one. I do think there’s one “fan favorite” that would win hands down, however. In the Buffyverse we’ve seen Angel return from a hell dimension and Spike go from soulless vampire, to ensouled vampire, to ghost, to corporeal being again. So anything is possible… but is it right? It’s a quandary isn’t it? If you bring someone back to from the dead there should be consequences, and even then, doesn’t that lower the stakes if you know there’s always some magical “get out of jail free” card? Still, we didn’t mind when Buffy was returned to us – albeit somewhat psychologically scarred – after her death in Season 5, when Willow and her friends chose to resurrect her with dark magic. But there was a price… There is always a price. A life for a life… and lasting ramifications for Buffy and the Scoobies. You would think they’d all learned their lesson on that one. Well, some folks never learn, as we found out in last month’s issue. HOW DO YOU SOLVE A PROBLEM LIKE ANDREW? This issue picks up where we left off – with Buffy, Spike, Willow and Andrew – back in Sunnydale, during Samhain, with a hell of a lotta spooky-doos and magic don’ts right at the Hellmouth. When we last saw Andrew, he was attempting some magic don’ts of his own, using the Vampyr tome. Resurrection spells require a great deal of dark energy, and we all know there is no such thing as a free ride. Needless to say, there are some unwanted side effects, namely a soul-eating beastie of epic proportions. Of course, this trip home to Sunnydale also leads to some soul-searching for our heroes and perhaps some promising confessions. Redemption, forgiveness and acceptance are recurring themes in the Buffyverse, and ones which come up again in “Return to Sunnydale”. Without giving too much more away, I will say Christos Gage and Rebekah Isaacs (along with Dan Jackson and with stunning cover art by Steve Morris) deliver another strong installment for Season 10. And while Buffy fans may not get the ending they were hoping for, they do get an emotional and satisfying resolution to the Halloween story. Certainly worth the emotional ride. 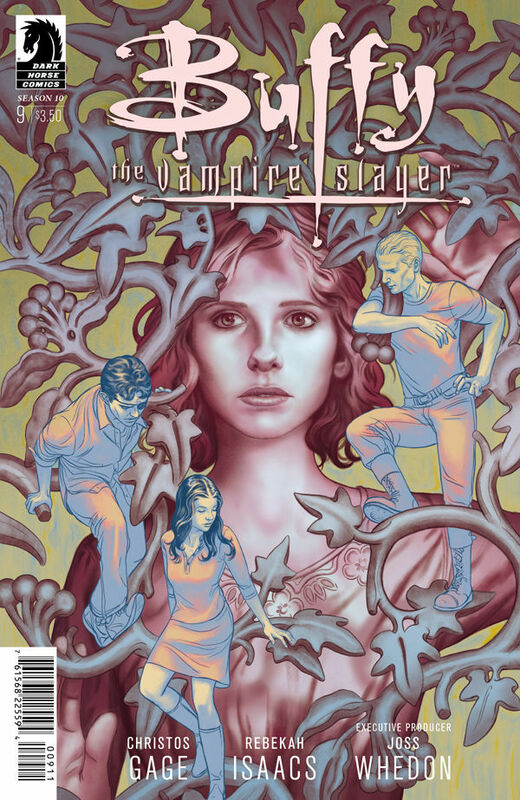 Buffy the Vampire Slayer Season 10 Issue #9 from Dark Horse Comics is out today at a comic book store near you! WHO SAYS YOU CAN’T GO HOME? This year, Dark Horse Comics debuted Buffy The Vampire Slayer Season 10 with Christos Gage and Rebekah Isaacs crossing over from the Angel and Faith series (also from Dark Horse), to take the helm for Joss Whedon’s and Dark Horse’s flagship book. Written by Gage, and beautifully illustrated by Isaacs, the Scooby Gang are back and better than ever. In this latest installment, Buffy and company must return to Sunnydale. And in a world where the rules of magic are being re-written, there is no telling what consequences spell-casting will have, especially that close to the Hellmouth, the epicenter of evil. Even worse, the playbook Buffy has been using since first becoming a Slayer is missing. The Vampyr book, first given to her by her mentor and Watcher Rupert Giles (played in the series by Anthony Stewart Head), has been taken. By what, or whom, is anyone’s guess. Meanwhile, has anyone seen Andrew? 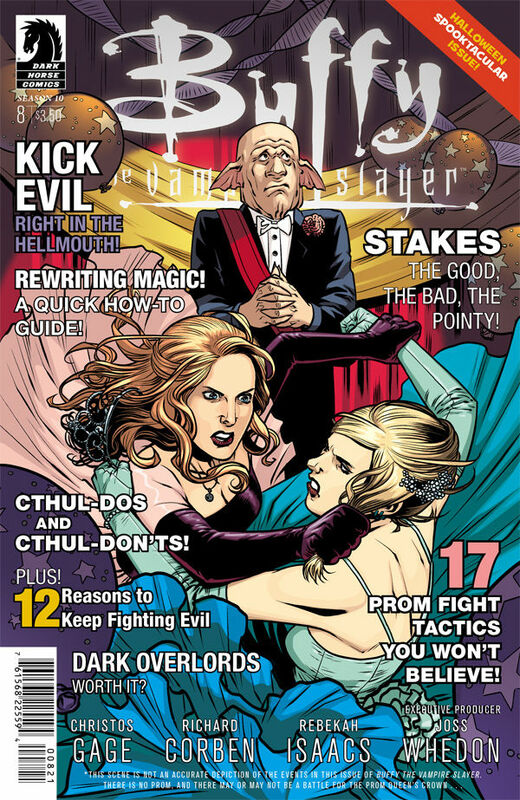 Issue 8 is an entertaining, quick read and left me wanting more… A must for Buffy fans, both old and new. I’m sure there’s a hell of a pay off, so stay tuned for the next issue. 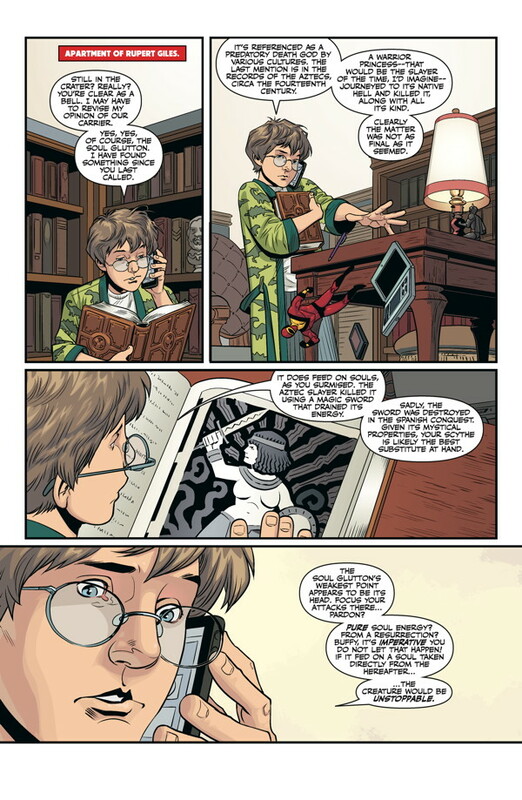 For more on Buffy the Vampire Slayer Season 10 from Dark Horse Comics, check out my reviews at Skeletonpete.com. 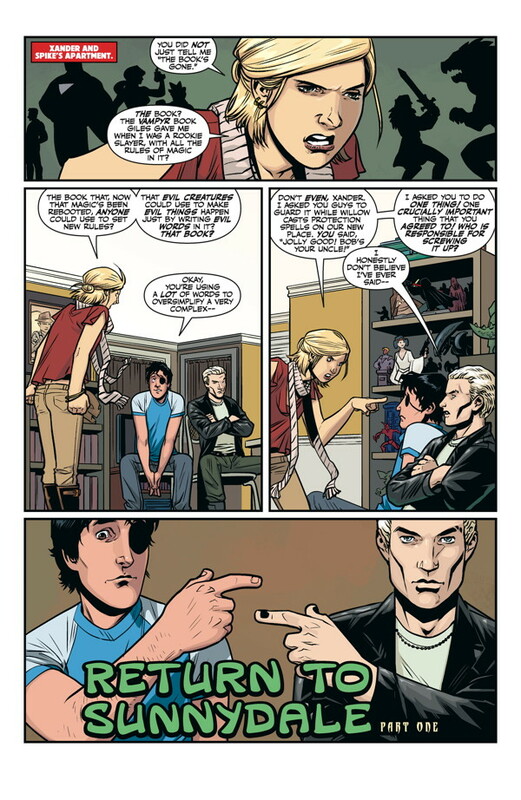 Buffy the Vampire Slayer Season 10: Issue 8 is due out tomorrow, October 22, 2014! Get it at a comic book store near you! Attention Female Sci-Fi Writers: Doctor Who Needs YOU! 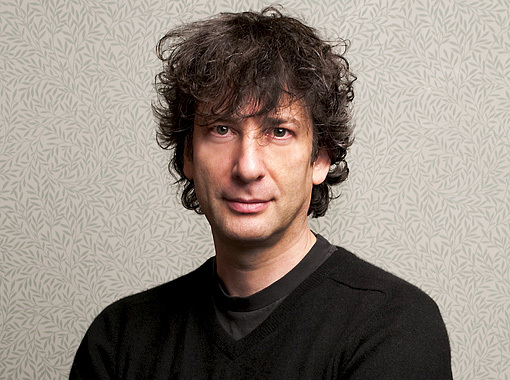 Recently, Sandman and Neverwhere author Neil Gaiman, commented on the lack of female writers in Doctor Who. He would know, having penned two stories himself (The Doctor’s Wife, Nightmare in Silver) for the current series. But that can’t be right, can it? I thought long and hard to myself, and truthfully, while I can recall female directors and producers (after all, the series was birthed by the late Verity Lambert and producer Julie Gardner was instrumental in helping Russell T. Davies bring back Doctor Who in 2005), I can’t – off the top of my head – recall female writers for the series. This really gnawed at me. Often, I cite Paul Cornell as one of my top writers for the current series. Paul writes compelling science fiction and drama, as evidenced in The 10th Doctor story (originally written for 7th Doctor Sylvester McCoy) Human Nature and Father’s Day (for 9th Doctor Christopher Eccleston). Even upon repeated watchings, I am always moved to tears by these episodes. Back in the day, it was Robert Holmes who wrote some of the best stories for the classic era, including The Deadly Assassin and Talons of Weng-Chiang (for 4th Doctor Tom Baker) and Caves of Androzani (for 5th Doctor Peter Davison). Surely, my favorite sci-fi show of all time had just as many female writers, right? Right? Anyone? Anyone? Bueller? I owe Doctor Who for inspiring my love of science fiction and desire for self-expression. I was one of those fanfic and fanzine writers who felt compelled to expand on The Doctor’s universe. Yep, I was one of the ones people snickered at. We found refuge at conventions and dared not share our creations with the uninitiated. They wouldn’t understand… They just wouldn’t get it. Times have changed, and some of those same con-geeks and nerds are among some of the most successful writers and producers in film and television today. Fanboys Peter Jackson (Lord of the Rings), Russell T. Davies (Doctor Who, Torchwood, Queer as Folk), Mark Gatiss (Doctor Who, Sherlock) and of course, Steven Moffat (Coupling, Doctor Who, Sherlock), all started as fellow nerds and Whovians. But that’s a rather testosterone–laden list. Maybe Buffy and Battlestar Galactica alum Jane Espenson (she also wrote for the Doctor Who spin-off Torchwood starring Arrow’s John Barrowman) should have a go as head writer/show runner for Doctor Who? 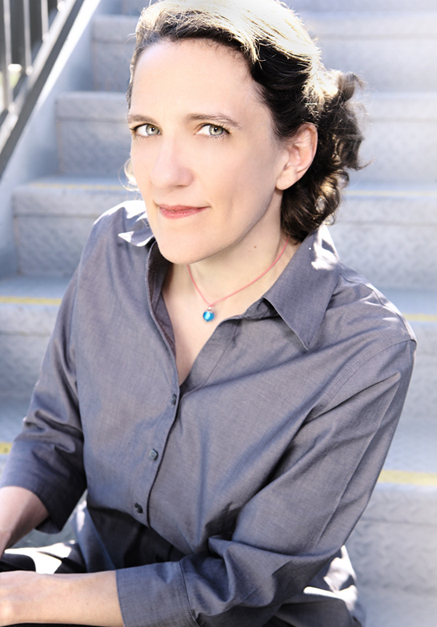 She’s written for just about every sci-fi/fantasy series in recent history (the ones I care about anyway), including Game of Thrones and Firefly. Perhaps Outlander author, Diana Gabaldon, should try her hand at writing for our favorite Time Lord? Considering Outlander’s connection to Doctor Who it wouldn’t be a stretch. I wouldn’t mind a return to purely historical Doctor Who stories like The Aztecs, The Crusades and Marco Polo (from the William Hartnell/First Doctor era). Fellow Whovians, which female writers would you like to see pen a Doctor Who script? Series 8 continues… Stay tuned for tonight’s episode of Doctor Who – Flatline. Airing Saturday, October 18th at 9pm on BBC America. I can’t believe how happy these pictures made me feel. 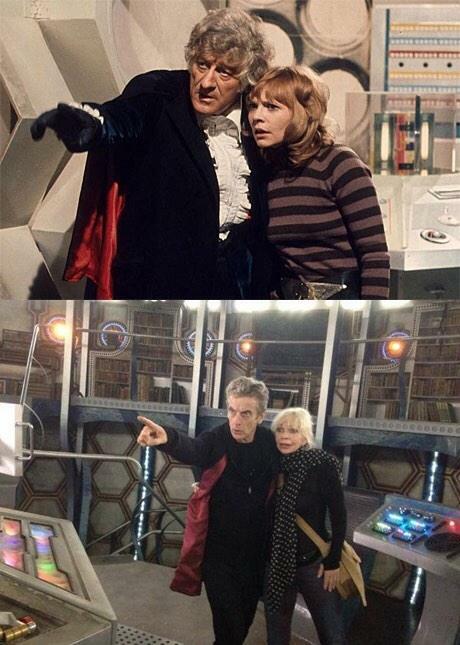 It struck me how right they looked together – Doctor and companion – together again. 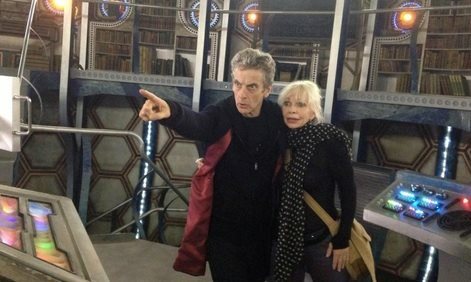 Thus proving that Peter Capaldi is the man for the job. Katy loved returning to her old (if renovated) home, the TARDIS, and getting treated to a sneak peek of the upcoming Christmas special. 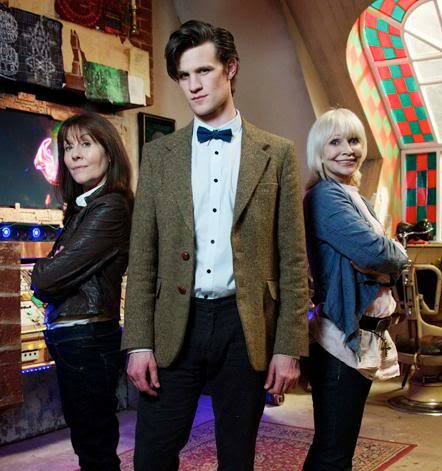 “I know is going to be the best Xmas DW special!” She said. And as The 10th Doctor (David Tennant) says to The 5th (Peter Davison) in Time Crash, “all my love to long ago…” We sincerely hope to see Katy on board the TARDIS again soon. In the meantime, Series 8 continues. Stay tuned for tonight’s episode of Doctor Who – The Caretaker. Airing tonight on BBC One at 8:30pm and at 9pm on BBC America. Exploring the past of the most seductive, glamorous and entertaining kingdom on Earth. It's Stuff We Like, You Might Too!